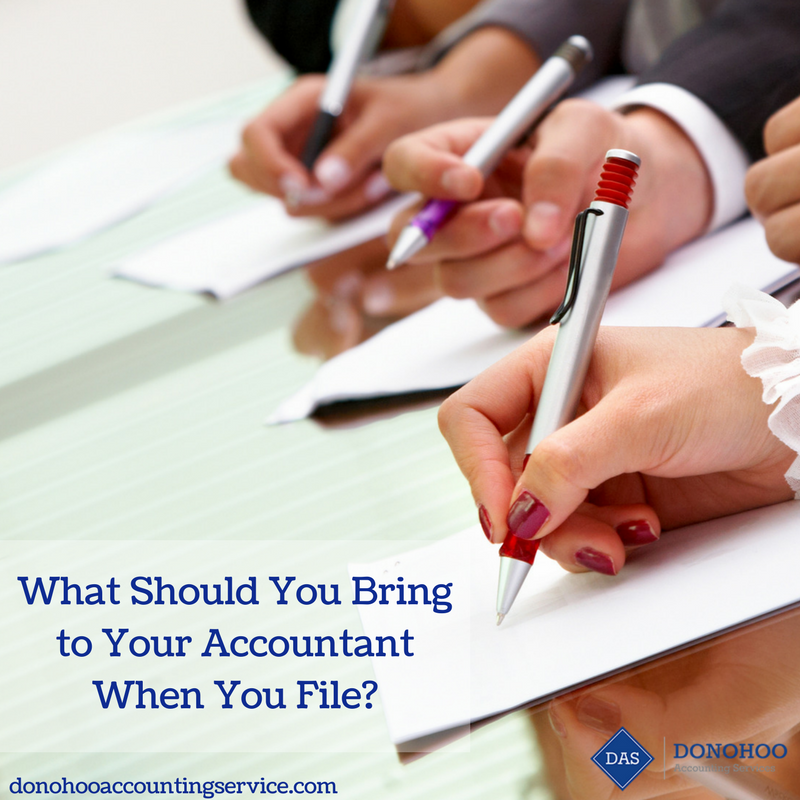 What Should You Bring to Your Accountant When You File? Although it’s technically possible to file your own tax return by using software, this can leave you exposed to a wide range of issues. If you want to ensure that everything with your tax return is handled by an experienced professional, working with a reputable accountant is an investment that should always pay off by unlocking extra savings and helping you avoid mistakes. The accountant you work with will want to verify your identity prior to submitting your filing. And if you are claiming any dependents, it’s a good idea to bring their card along as well. Although social security numbers seem like an easy enough thing to manage, SSN mistakes result in 100,000s of tax returns being sent back by the IRS every year. Since that’s guaranteed to increase how long it takes to get your refund, bring along your cards so your accountant will be able to double check the accuracy of these numbers. Even if your financial situation has changed quite a bit over the last year, it’s still helpful for an accountant to have your previous year’s return as a reference point. This will allow the professional you work with to identify which deductions and credits you previously claimed, then quickly see if you’re eligible for them again. If you work as a traditional employee at a company, your employer should have already provided you with a W-2 form this year. This document has a lot of important information your accountant will need, so be sure to bring it along. For freelancers, the most common form to receive is a 1099-Misc. And if you have any investments or other activities that produced income, you’ll want to bring all of those forms along for the accountant to review. Did you make some charitable donations over the course of last year? Maybe you do some selling online and drove around a lot to source inventory. Regardless of the specific donation or expense, an accountant is going to want to see documentation before claiming it for you. While it may take some time for you to get organized prior to your appointment, it will be well worth the effort.